The government’s apprenticeship payments report system has been broken for almost a week – and there’s no fix currently in sight. 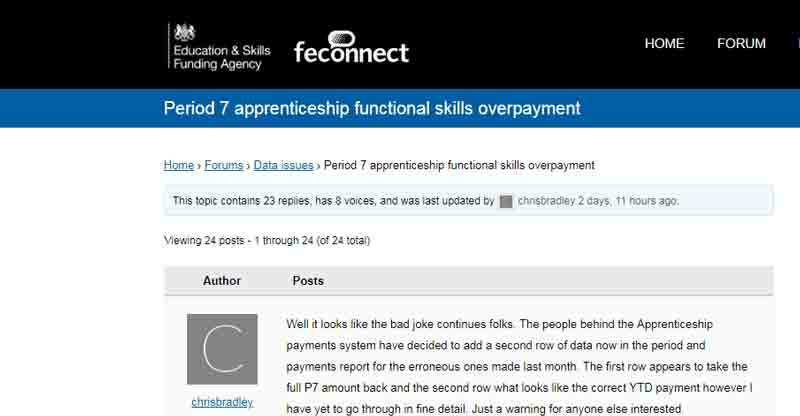 Complaints about the online system first appeared on the Education and Skills Funding Agency’s FE Connect site on April 10. A day later, the agency admitted to “an issue with the apprenticeships monthly payments report” and that it had “identified the cause and are currently working on a resolution to this”. Despite nearly a week of work, however, the problem has still not been resolved, even though it is being treated as an “urgent investigation”. “The people behind the apprenticeship payments system have decided to add a second row of data now in the period and payments report for the erroneous ones made last month,” said the first complaint. “The first row appears to take the full P7 amount back and the second row what looks like the correct YTD payment however I have yet to go through in fine detail. Just a warning for anyone else interested. Two days later the ESFA was “testing a fix to the issue which was identified”, and an update had been promised this morning. “Please accept our apologies for any inconvenience caused by this,” said a spokesperson. The current message on the Hub, updated this morning, says that testing is ongoing. FE Week reported on other issues with the apprenticeship payment system last December. Providers were again left irate messages on FE Connect. One of many was from Chris Bradley, who showed FE Week an apologetic message he received from the ESFA’s business operations service centre. It recognised that the apprenticeship funding system had been incorrectly expecting cash contributions from levy-funded employers, in a case relating to Nottinghamshire-based provider SREducation, where Mr Bradley was data and contracts manager. He has been back on the forum in recent days, to express further frustrations. Update: April 19: The government missed its own deadline to finally fix its malfunctioning apprenticeship payments reporting system. The ESFA promised a fix by April 18. “We are currently in the final testing stage of an updated report that will fix the issue of duplicate rows and also fix many of the known outstanding issues we have been working behind the scenes to improve,” said a spokesperson on April 17. However, as at April 19, the system had still not been restored after a week and a half of work, even though it was being treated as an “urgent investigation”.